Sorry I tossed out Lee's name without an address -- comes from knowing the guy for almost 40 years. Friday was deadline for legislation to make it out of committee in the house of origin so it was a bit chaotic and I have not been on the forums. here is my Kemtron shay so far. The goal was to make this locomotive look more like a Mann's Creek shay, kind of a cross between MC #8 and MC #5, mine will be numbered 7. The MC's shays all had enclosed cabs which I am sure was to make them warmer in the winter. 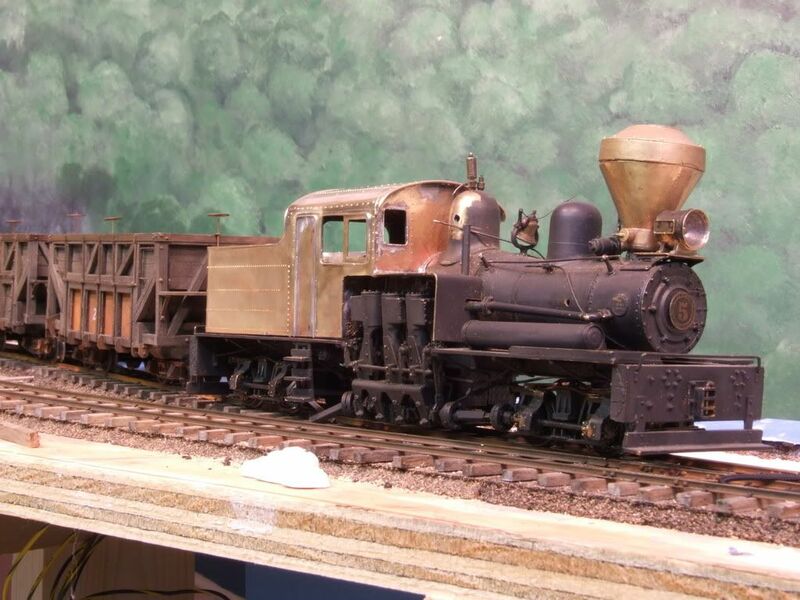 When I got this shay I liked the looks of it but it looked more like a western logging shay than the ones I had seen in the east, so I removed the cab and tender and started to build my own in brass. The doors will be open but I am waiting to cut out the doors until I get the new cab all fitted to the boiler and the mounting screw holes all drilled, that way everything will line up and I don't have to worry about something being weak when I cut out the door openings. The front windows will be in full open position and I will add a roof vent, gutters, and hadrails next. I am going to scratchbuild some bigger sand boxes for the back, scratchbuild a new ladder, add a backup light, and some coal boards. The motor is just a little higher than the top of the tender so I am going to build a little bump up that I will cover with coal. after that the new cab and tender will be finished and I will move on to detailing the rest of the shay. I plan on making this shay super heated so I am redoing all the steam pipes on the side. I also have most of the stock piping either pulled off or bent out of the way, most of it will be redone. I just ordered a bunch of junk for the walkways and some new drive parts. this will be my main locomotive from the dump trestle to the mines so I want it to run really good. the body is just sitting on the frame for the photos and is not tight so it looks a little cocked. Also the rear truck is not attached and I just set the frame on it. I admire people who can do this out of a sheet of brass. Amazing looking shay Jeff! How many hoppers are you hopping it can pull? It looks like a brute. I am hoping for 8-10 hoppers up my planned 5-6% grade, but my hopper cars pull pretty hard empty because they all have electrical wiper pickups on every wheel to power the decoders that open the doors. 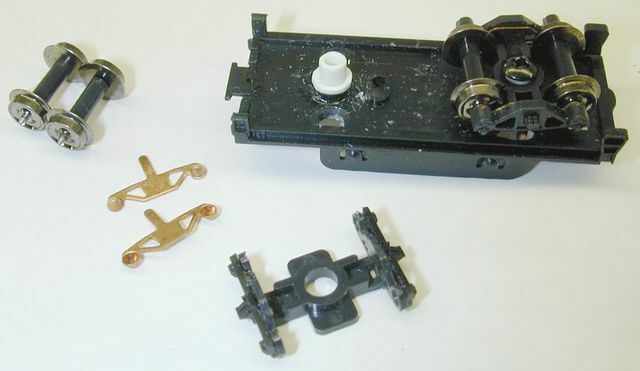 I was considering making contacts on the bottom of the hoppers that would touch some contacts at the dump trestle to operate the doors so it would reduce the drag cauzed by the wheel wipers, that would make it easier on the locomotives and would not require that each hopper have a DCC decoder in it. Are you still considering doing that with your hoppers? I suppose if you kept the wipers on the hoppers it could be useful as brakes coming down your steep grade when they are fully loaded with coal. Keep the train from racing down the hill. You need to try some Kato (N scale) style low friction pick-ups. They use cup that the axle points ride in. those Kato pickups are a good idea. I can't use them on my trucks because the axles are insulated but I will have to remember that idea for future projects. Nice work so far!! Keep it up! I have a question about the ore cars. They look like a type of side dump through the bottom doors. Would this be correct? Are there plans for these cars available somewhere? They're very interesting to look at. 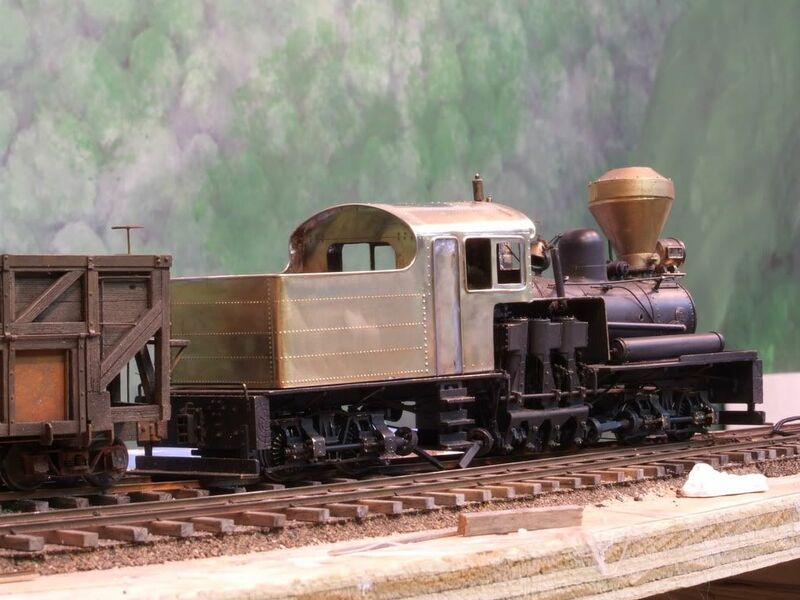 I'm thinking I'd like to build a few and adapt them for my standard gauge HO mining layout. Beautiful brass work on the Shay so far. Thanks for the heads up on the hoppers......sure do like 'em. not too much happening on the RR these days. I had to put my cat to sleep last week, which was totally unexpected, and I did not feel like doing any model railroading. I finally got back to the work bench last night and did some more work on the shay, It is starting to go the other way now and I am actually making progress. I am waiting for some replacement gears from Grandt Line which are taking forever to show up. One thing I have struggled with modeling in this scale is that everything has to be ordered and some places take forever to ship, sometimes Grandt Line is one of them and I don't know why. Coaltrain, sorry about your loss. I know how I would feel if my furry little pal had to be put down. Modelling might help? Greg.